Come up out the water, like a Bloodstained Dolphin … maybe that’s a touch esoteric. After all of that “MIght No. 9” nonsense, I’m so relieved that Bloodstained: Ritual of the Night has been an absolutely amazing experience. A week ago or so, we received access to the Backer-only demo that was dropped, featuring a good couple of hours of gameplay, depending on how fast or slow you prefer to go. For those who missed out, Mighty No. 9 promised to be the rebirth of the Mega Man-style platformer. It had so much promise. Then … life happened, and it turned into a giant pile of disappointment. If sadness could have a flavor, it would have Mighty No. 9’s label on the container. That’s where Koji Igarashi comes in. Koji Igarashi, often simply credited as “Iga”, worked on arguably one of the best installments (the best in my opinion) of the Castlevania franchise: Castlevania: Symphony of the Night. Turning the Action Platformer into a Metroidvania, you played as a pivotal character in the lore, exploring Dracula’s castle, unlocking mysteries as well as new and incredible powers. It was now an RPG that combined Metroid’s love of finding new power-ups. Mighty No. 9 was a vast disappointment. Bloodstained is not. Thus, the Metroidvania was born. Maybe there were Metroidvanias before this, but none so perfectly crafted. 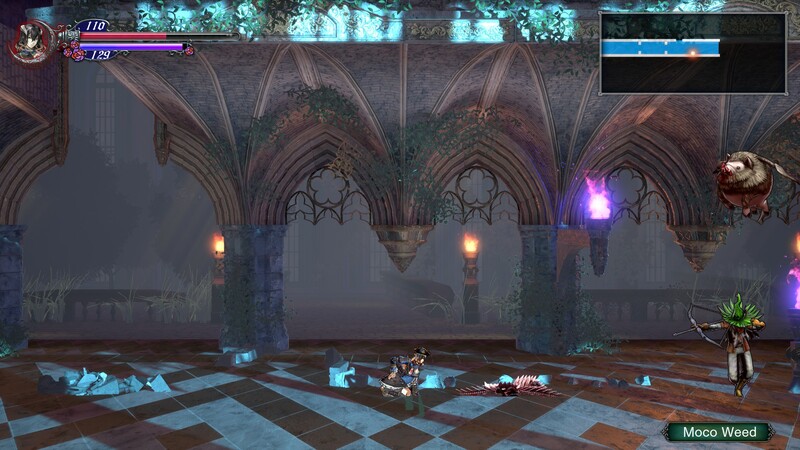 So when I heard that Bloodstained would team up with a studio to come to life, I was a bit worried. Look what happened when people helped with Mighty No. 9! Thankfully, Mega Man 11 will erase that stain off of the ledger. However, I have nothing to fear. Neither does anyone looking forward to the game because I can promise you, that this demo knocked my damn socks off. Outfoxed put it best, “That Bloodstained demo is the perfect length. Short enough you don’t feel like you played most of the game, long enough to prevent you from going, “That’s IT?”! 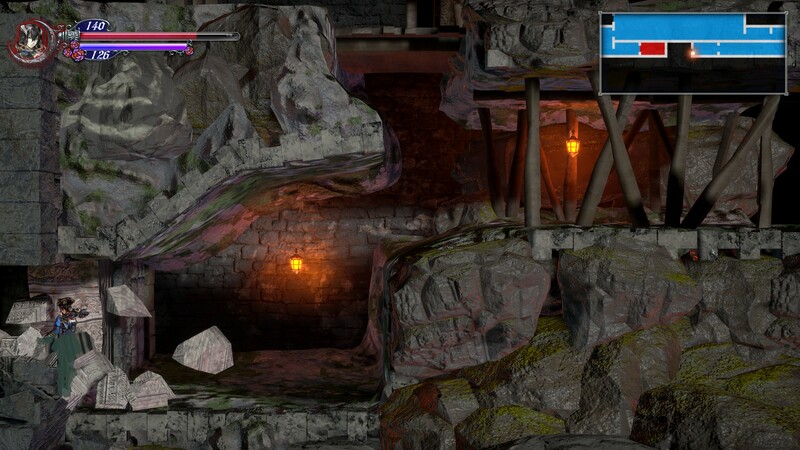 You get to see several of the areas, from the prologue area that gets you acclimated to the controls/style of gameplay, which, if I’m being honest, is incredibly easy to get used to. Only challenging part is having two magical buttons, one of which is aimed by the right stick. The first major boss fight is absolutely wild. One of the complaints that were levied at Symphony of the Night is that it was confined just to Dracula’s castle, and a lot of the fun of the earlier titles was the actual hunt for Dracula, going through his domain, finally reaching his castle, and doing battle. 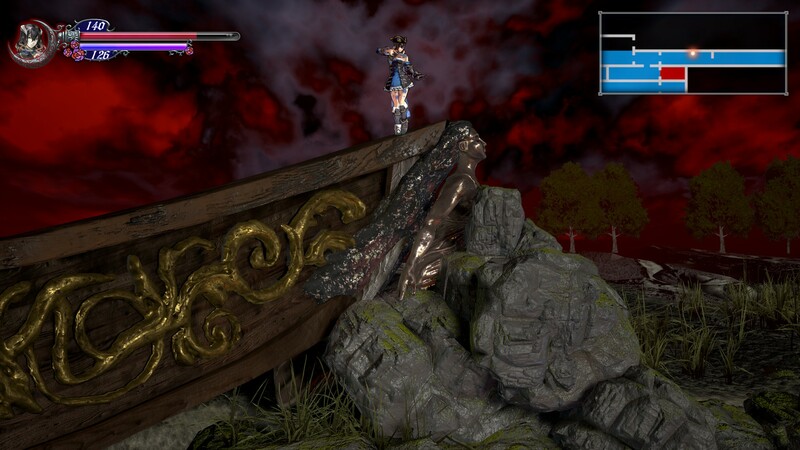 So far in Bloodstained though, before heading into the castle proper, we were in another castle/building, on a boat, in a ruined, desolated village, then the castle. I have a feeling we’ll have plenty of different areas to explore on the castle grounds too. So you play as Miriam, but I feel like maybe it will have other characters to play with? That I’m not so sure of, but there are several NPCs that have enough depth that I could see them being playable options in the future. For fans of SOTN, a great deal of this will feel familiar. You’ll explore a vast area, leveling up, buying and finding new equipment, acquiring spells, but here’s where the differences begin. In Symphony of the Night, you had all of your spells right away, if you knew the button combinations. Oh, how I hated those because I was so bad at them. In this, killing enemies has a chance to reward you with a “Shard”, and these shards are equipped for a variety of spells and effects. You have one for stats, one for summons, and two activatable Shards, one that can be aimed, and one that is just activated. This means that it becomes necessary to do a little grinding if you want them because you aren’t guaranteed them. I do not know if bosses are guaranteed drops, but getting the giant tentacle shard has been an absolute blessing. For regular enemies, you can simply keep killing them to power up the shard to a certain amount, but beyond that, you’ll need to look to Alchemy. Alchemy can also make potions and gear if you have the right ingredients, so you’ll be doing a lot of killing. But not once did I feel like I was wasting my time; every moment doing something was something worth doing. There are lots of cool hidden items and secrets, plenty to uncover, and depending on what weapons you like and Shards, different ways to approach boss fights. Though speaking of weapons, there was one minor thing that really ate at me. Weapons have vastly different hitboxes, which makes sense – they’re all different weapons! However, some creatures and lamps (like in Castlevania, you break them for items) become pretty frustrating to hit, for example, if you are wielding the spear weapons. I get it, you only really use the tip of the spear to hit stuff, but it is so frustrating to jump down and watch the pole of your spear go right through something you wanted to hit. It makes sense, but it’s vexing anyway. Bottom Line, that is the only complaint I’ve had so far. I adore everything about this, and I’m so glad 505 is working to help bring this to life. If such a wildly-funded game were to be a flop, I don’t think people would trust Kickstarter/Crowdfunding again. The voices are fine, I love the art style around the splashes of characters, each area looks gorgeous, the music is lovely, and the combat is fierce and makes sense. Some of the equipment, like in SOTN changes cosmetics for the in-game sprite (Pirate Hat, Elven Ears, et cetera), and the controls are tight and responsive. This is everything I could have hoped for. I wish I could thank Iga in person for this because I’ve missed this style of Metroidvania. 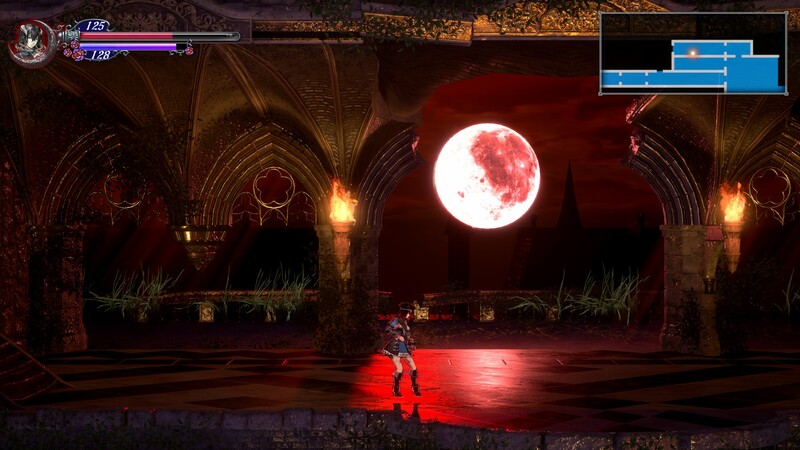 Kudos to them for also releasing the 8-bit spin-off game, Bloodstained: Curse of the Moon. Curse of the Moon is Castlevania 3, but with good mechanics. Extra characters and all, even if you don’t have access to Bloodstained: Ritual of the Night, and you love 8bit platformers, please please go play Curse of the Moon on Steam. It’s cheap and worth every single penny. I should really stream some Ritual of the Night to show it off…Trust in me, if this is your kind of game, and you’ve been longing for one, it’s coming and it’s worthwhile.